Jackiem Joyner started his career as sideman in Marcus Johnson's band along with tours accompanying Bobby Lyle, Angela Bofill, Ronnie Laws and Jean Carne. Already with his debut album Baby Soul (2007) he built the fundament of a strong fan community receiving high acclaims. His sophomore release Lil’ Man Soul (2008) quickly climbed the jazz charts. His newest release Jackiem Joyner (2010) sets unique accents just to make a difference to the legion of other smooth jazz saxophonists. Jackiem has a great affinity for rhythm. “Ever since I was 12 in my mom’s house, I’ve been drumming on walls, tapping out rhythms with spoons and beating on anything that I can. I still have that habit today. I always hear beats in my head; it’s intriguing to see where they take me." No wonder that The Reunion melts the style of smooth jazz with the beat of marching bands. Dance With Me offers Latin flavor with Flamenco guitar, timbales, the whole package. Osaka born Kay-Ta Matsuno plays the acoustic guitar. Currently he plays with Alanea Alexander (Rock/R&B) Planet Vinyl (70's Funk) Mauli B (Hip Hop/R&B) Ko Kanza group (Jazz) and THC (Theatrical Rock). He supports Jackiem on several tracks of this album. Back Together Again shows more of Jackiem's great talent to combine mellow smooth jazz sax with appealing drum grooves. Beside his own compositions Jackiem also performs on this album fantastic cover versions of legendary Michael Jackson's Off The Wall or Aerosmith's power ballad I Don't Want to Miss a Thing. With martial beats Jackiem steps into the second half of his album doing the Push. Heroic horns and the marching drum are also the musical background on Home. Best suited as score for a long awaited home coming. The fluttery ballad of Jennifer Hudson If This Isn't Love finds a new refinement. For the next tune Turn It Up Jackiem could invite the prominent guest musician guitarist Paul Jackson bringing in some funky notes. My Last Goodbye closes the album with delightful sweetness. 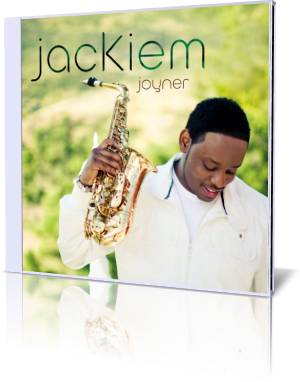 With his third album Jackiem Joyner reached the peak of his current musical career. Innovative beats, melodies and arrangements are his gifts, he can be really proud of.